At the Vista Center, we believe that people should become passionate about their food – – but at the same time be smart, with an eye on health. Always look for fresh, organic and local ingredients where it makes sense to do so. Read your labels and become familiar with your ingredients. You truly are what you eat. 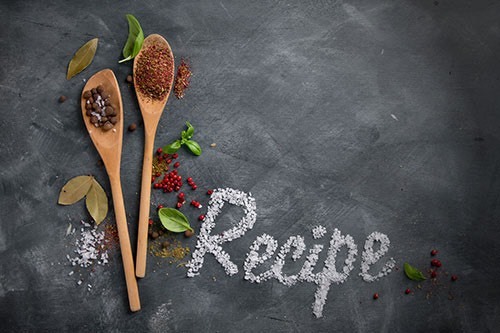 Here is a collection of recipes that we are continually updating that we believe can help put you on a path towards better health without compromising on taste or spending your life in the kitchen. Most of these we have personally made and some we consume on a regular basis. Smooth and just the right amount of “heat” … Voted best Winter Soup Ever! Similar to above … smooth with just the right amount of “heat” … Another Great Winter Soup! This brings in a whole new level of healthy decadence! Smooth and zesty … best served really cold in the dead of summer! Baking your own goods is the only way you can get to know every ingredient that goes into the mix – – and hence into your body! Split pea soup is a classic – – and this version will not disappoint! Soups are a wonderful way to warm the heart! This Italian classic will keep them coming back for more! These bran muffins provide a perfect balance of fiber and sweetness! Chocked full of the spices that you’d expect of Indian – – a real crowd pleaser! Baked in freshness – – where you get to control how much and what kind of sweeteners are used! Asparagus is one of the finest vegetables around! Simple and clean favors! A great source of carotenoids. An easy to follow recipe for folks who are on the go! Really high in Omega 3 fatty acids. Just a perfect meal for when you want to impress someone you love! So aromatic with just the right amount of sweetness. A Fall (and right through winter) classic! Don’t let the PBnJ reference fool you. Packed with Blueberries and Strawberries, this is an awesome pickup first thing in the morning… especially when fresh local berries are in season! Really tasty twist on an often overlooked vegetable! A Fabulous Late Fall to Early Spring Seasonal Recipe! Amazing and healthy mixture with a bright and vibrant and flavorful crunch to it! Quinoa is one of the healthiest grain options available! …is an Indian Vegetarian classic. Turmeric and these related spices are great for easing inflammation in the body! It’s all about textures and layering … the perfect amount of sweetness — So healthy! Just add almond milk.